Structure: 3 compartments for cash(or checkbook), 12 card slots,and 1 inner zipper pockets. High quality clear fashion texture, with simple styling, best ideal option for outdoor use (walking,camping,shopping etc) and travel,daily life use as well,It's also a great idea as a small birthday gifts for women / present for the one you love. DIMENSIONS: (L)7.67" x (W)1.1" x (H)4.13" inch. INTERNAL STRUCTURE This women wallet contains 3 cash holder (also checkbook holder ), 1 zipper pocket, 12 card slots. 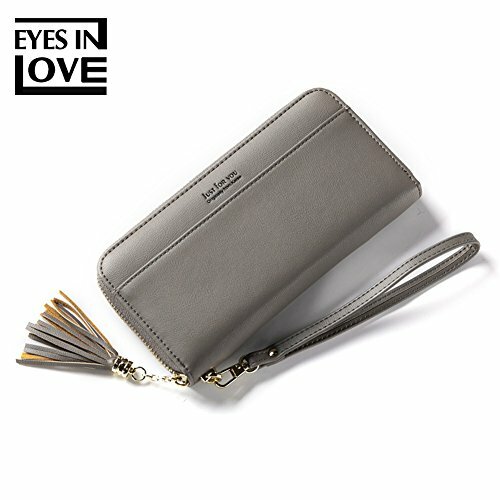 Large capacity designed for you to hold iphone 8 plus /iphone x, credit cards, id cards, cash, coins or other small thing. Well organizer. If you have any questions about this product by Ubags, contact us by completing and submitting the form below. If you are looking for a specif part number, please include it with your message.